My husband and I used to have quite a few facial creams, body washes, and lotions that cluttered our shower and cabinets. 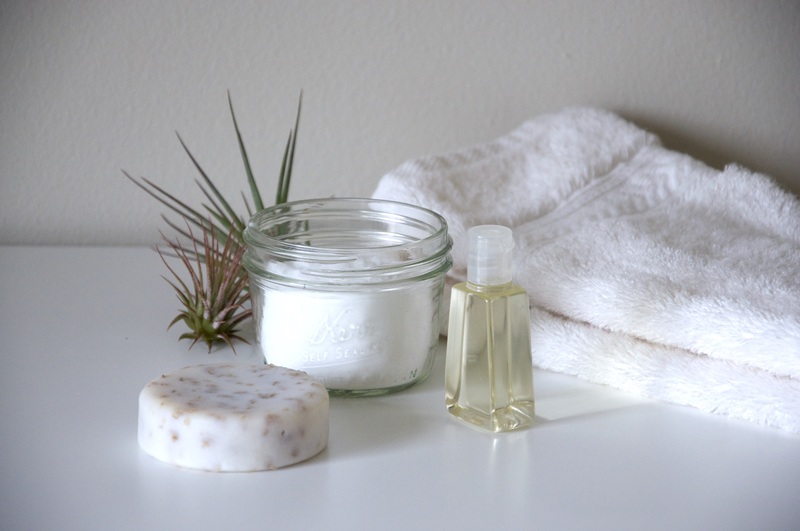 To eliminate clutter, reduce harmful ingredients, and lower costs, we replaced all of it with the following inexpensive, low-waste, multipurpose products. Cleanser — I recently wrote about my love for shampoo bars, but they’re excellent body and facial cleansers as well. The lather works is great for shaving and removing makeup too! I love this bar and am impressed by its minimal packaging! 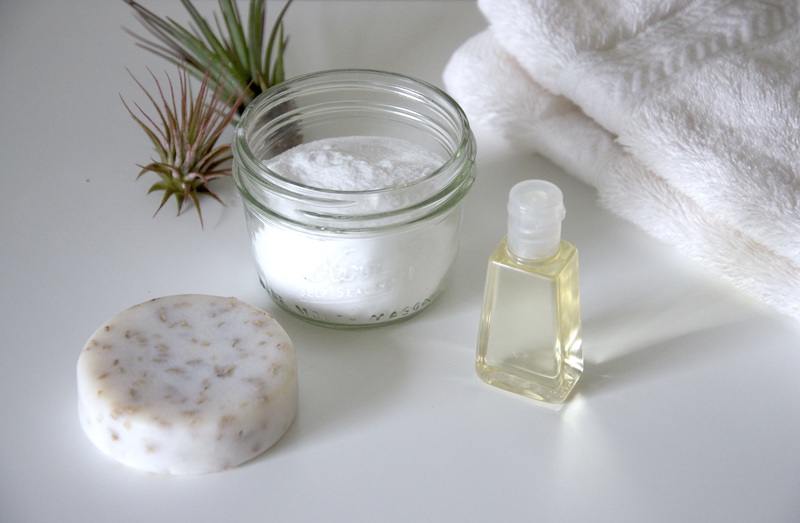 Scrub — We use baking soda, salt, and sugar as exfoliants and simply pull them from the pantry as necessary. This is a great alternative to using conventional products that contain plastic microbeads, which aren’t friendly to waterways and sea life. Moisturizer — I’m currently using organic sunflower seed oil as a facial and body moisturizer. A drop or two is all I need for my face. I probably could use something lighter, like jojoba oil , but I purchase sunflower seed oil for cooking so I like that I can use it for a variety of purposes. Coconut oil, olive oil, or shea butter work great for treating excessively dry skin, though I really only use those occasionally in the winter. Note: Coconut oil isn’t recommended for the face since it can clog pores. I’m amazed by how much clutter these simple items replaced. They replaced: body washes, scrubs, masks, facial cleansers, face lotion, body lotion, hand lotion, toner, shaving cream, mechanical exfoliating brushes, eye creams, serums, makeup remover, face wipes, and acne wash. In switching to these simple products, I’ve also noticed less skin irritation, dry skin, and strain on my senses. I think that eliminating harsh chemicals like “Fragrance” (Toxic! Skin Deep rated this ingredient as an eight on their toxicity scale!) from my list of acceptable ingredients made all the difference! Turns out that my skin doesn’t actually need all of the expensive creams and harsh cleansers! Truly loving this simple routine! Love!! Thanks for sharing! Will certainly check it out!! Right you are.. Natural products are always better than chemical products as skin care. I have also used that scrub previously. That works really good. Woohoo! The next things on my list to experiment with are homemade makeup and deodorant. Do you use any other natural things for skin care? Yeah I used sugar mixed with lemon juice as scrubber. But I think it would be hard for your face, but it really works well for the skin of elbow and knees. Oooo, that sounds so wonderful, especially in the winter. Thanks for the suggestion! Will do!! All the fun things that I want to try in 2018 can’t come quickly enough! Hi 😊 I’m French and I love ur article ! I try to become minimalist and your article will help me ! That’s awesome!! I also recommend checking out these websites for additional thoughts and tips: http://www.becomingminimalist.com and http://www.theminimalists.com. Thanks u ! I will see that 🙂 ! Many wouldn’t think of armpits for skin care, but do you use something similar for the armpit area? I’ve been reading about direct application of essential oils and also baking soda. Would love to know your thoughts and experiments on this. Thanks for asking! Tackling homemade deodorant is on my list for 2018. I’m going to try this recipe from Lauren over at Trash is for Tossers first. http://trashisfortossers.com/zero-waste-deodorant/. Thanks!! I’ll be checking that one out! Interesting post. I switched from expensive face products to natural skin care this year (2017) and the result is great! I am interested in making my life more minimalistic. Will check out your blog for more inspiration. Thanks for sharing! I also started my blog and was thinking to share my experience with natural products and getting minimalist. Awesome! Thanks for sharing!! I do have to say that my face looks and feels so much more hydrated now. I especially loved getting rid of the heavily fragranced products, such a difference! Thanks for the comment! I completely agree! I really have to get rid of everything that is not important and irrelevant…Experiences and simplicity are what really matters and stuff! Great blog! I really like the minimalist layout! So true! Letting go of the extraneous let’s the important things take precedence. Thanks for the encouragement and cheers to your journey!